Partial dentures work by helping you if you are missing teeth. Though it might not seem like a big deal to have a few teeth missing, especially if the problem is not cosmetic, it can actually damage your overall dental health. Partial dentures help you avoid serious problems if you have missing teeth. Partial dentures provide a number of benefits and make it easier to eat when you are missing teeth. Partial dentures can also make it easier to speak if you’re struggling with missing teeth and communication. They can also prevent facial changes after you’ve lost teeth. 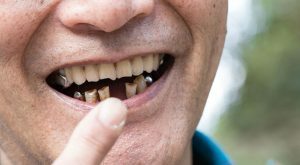 Depending on the location of the missing teeth, partial dentures can support the lips and cheeks, so your face won’t look as if it’s sagging. The other important thing partial dentures do is to prevent nearby teeth from drifting or tilting into the space left by the missing teeth. This is one of the greatest risks of having missing teeth. It’s possible for other teeth in your mouth to shift and cause problems with your bite, or place stress on the other teeth. 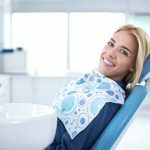 It can also be a struggle to keep shifting teeth properly clean and maintained, which means you’re going to have issues with decay and gum disease. This article from New Beauty talks about things that cause your teeth to drift. Partial dentures are easy to use, but they might take a little getting used to. They are removable, unlike a bridge, but they mimic your natural teeth. Synthetic teeth that are modeled to look similar to your own are affixed to an acrylic base that is designed to match your gums. The base covers a piece of metal that holds everything in place. In some cases, the apparatus features a clasp that attaches to your natural teeth to hold the partial dentures in place. In some cases, you’ll also have some of your natural teeth crowned or capped to help your partial dentures fit into your mouth. 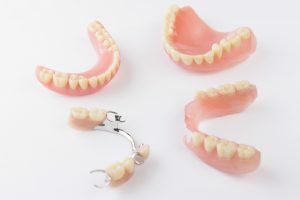 There are a few different types of partial dentures,and your dentist will be able to recommend the best option for your situation. Your dentist will also help you learn how to use your partial dentures. It’s easy, but it might take some practice. Guiding the dentures into your mouth while you’re in the dentist’s office ensures your dentist can make sure you’re doing it right and that the partial dentures fit properly. In most cases, they’ll feel a bit snug or unusual for a few days or weeks, but you eventually get used to them. 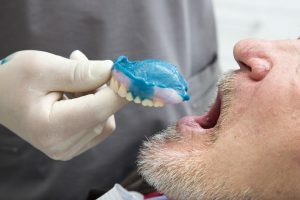 You should never be forcing your partial dentures into place, and if it feels as if you are you should visit your dentist to have the apparatus adjusted. It’s also important to understand the proper usage of your dentures. They should not be worn 24 hours a day. Most people take their partial dentures out at bedtime and put them in in the morning when they are completing their oral hygiene routine. There are often several follow-up appointments scheduled with your dentist once you’re wearing your partial dentures. 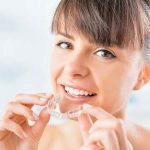 This ensures there are no problems and that the implement isn’t aggravating or irritating the soft tissue in your mouth. If there are any problems with your partial dentures, you should contact your dentist as soon as possible. Even if you get used to wearing your partial dentures quickly, you still might struggle with eating and speaking. It’s best to adjust your diet in the early days of wearing partial dentures. You can choose softer foods that are cut into small pieces to ease into eating with your dentures. Also, make sure you are chewing on both sides of your mouth. Sometimes people favor one side over the other without even realizing it. Avoid sticky or hard foods, especially until you are used to wearing your dentures. Even then sticky foods can be challenging. Prevention magazine provides a list of foods to avoid when wearing dentures. Your dentures should make speaking much easier, but if you find there’s a problem, it likely means your partial dentures need an adjustment. Speak to your dentist about the problems you’re having if you think speaking is an issue. Also, don’t be surprised if you eventually need adjustments to your partial dentures even if they worked perfectly,to begin with. Over time, your jaw bone can shrink,and your other teeth can shift. 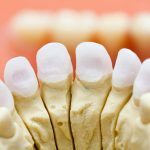 These changes might be imperceptible otherwise, but it can be enough to make your partial dentures feel uncomfortable. Wearing dentures that don’t fit properly can damage the apparatus and your natural teeth. It’s important to speak to your dentist the moment you notice any changes in the feel of your partial dentures, even if those changes are mild. You can find more information on locating a dentist to help you with your partial dentures here. It’s also important to contact your dentist if your partial dentures crack or break in any way. 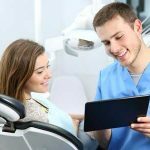 Not only does the apparatus need to be fixed immediately, you need to protect your oral health. A damaged set of partial dentures can irritate the tissue in your mouth. The pain might be moderate, but if the irritated area gets infected, it can lead to tremendous pain and mean you won’t be able to wear your partial dentures for a while. The last thing you want is to be in pain that was avoidable because of damaged partial dentures.